Xtradecal is a decal brand of Hannants, the leading UK mail order hobby supplier. This well-timed sheet was released at the 2009 IPMS UK Scale Modelworld in November. Aimed for the new 1/72 Airfix Spitfire PR. Mk. XIX, this sheet will be a great companion to any Mk. XIX kit of your choice! 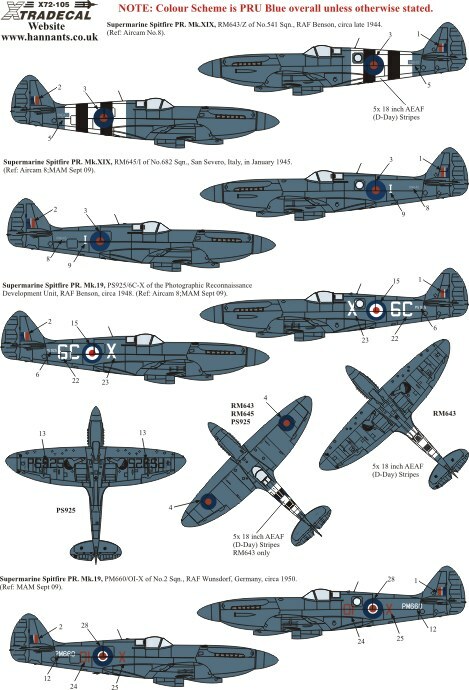 As most of you probably know, photo-reconnaissance Spitfires could be delivered in any colour of your choice as long as you picked PRU blue… correction: as this sheet shows, this was only partially true! 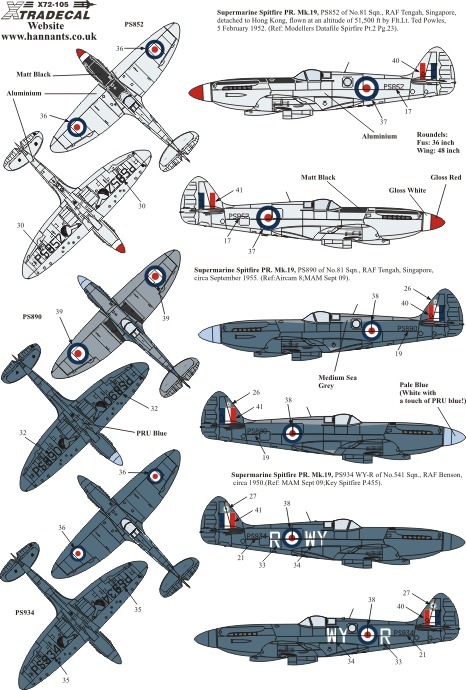 Of the impressive twelve options included, ten are RAF machines: two are wartime aircraft, both in PRU blue and one of them with full invasion stripes. There are also four post-1945 machines are in PRU blue with various versions of the post-war, more colourful, RAF roundels. Two machines are in different PRU blue / Medium Sea Grey schemes. Then there are two more in silver lacquer finish with black anti-glare panels. The final two markings are for Turkish Spitfires, one in PRU blue and one in green/light blue. I have found one disadvantage to this sheet; there is no stencilling included. And since there is no stencilling in the Airfix kit either, this has to be sourced elsewhere. Post-war marking options included on the sheet provide a welcome alternative to the rather uniform PRU finishes. With respect to the accuracy of offered markings, I have found photos of several of the options. Some differ in detail but I suspect that has more to do with when the photo was taken than the markings being wrong! One very obvious example is PM660, marked OI-X on the sheet. One well-known photo of a No. 2 Squadron line-up shows PM660 without any individual markings at all while another individual shot from another date shows PM660 marked as per the decal sheet. The instructions refer mostly to MAM September 2009 and Aircam No.8; I have used “Spitfire in Action”, “Supermarine Spitfire PR Mk. XIX” by MPM and “Born Again, Spitfire PS915”. Printing is, as always with Xtradecal, top-notch, decals don’t come any better than this! As for using them, I haven’t tried yet but having used other Xtradecal sheets with great success before there is no reason to believe that these perform differently. This is simply an excellent line-up of different colour schemes, getting as much variety as possible out of the Spitfire PR XIX in RAF markings. I would not hesitate to call this “a must” for anyone building the Airfix kit!